Ever been told you have trouble communicating? Designed to easily interface Z4 Tension Controllers with existing systems, EtherNet/IP™ is a new communication option to expand your capabilities. EtherNet/IP™ allows customers to easily interface with an existing HMI on the operator panel of the machine, allowing management to record, and store information about the condition of the machine. Because this option will reduce, or eliminate the need for running cables/wires during installation, EtherNet/IP™ never limits your process. Provides fast communication between the Z4 and any other device on the network. All necessary parameters for operation and performance tuning will be available on the HMI. The system can be tuned remotely via Ethernet and set-up via USB and our Windows App. When linked to an existing Ethernet system in the facility the controller simply becomes a node on the network. Allows for easier integration with modern factory setups; PLC’s and automated controls. All outputs are available for tracking purposes. 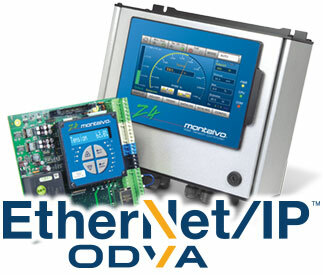 Maximize your productivity with Z4 Tension Controller EtherNet/IP™. Click below to learn more about specific Z4 models and their wide range of functions and features offered. For additional information or to answer any questions contact an Application Specialist today!